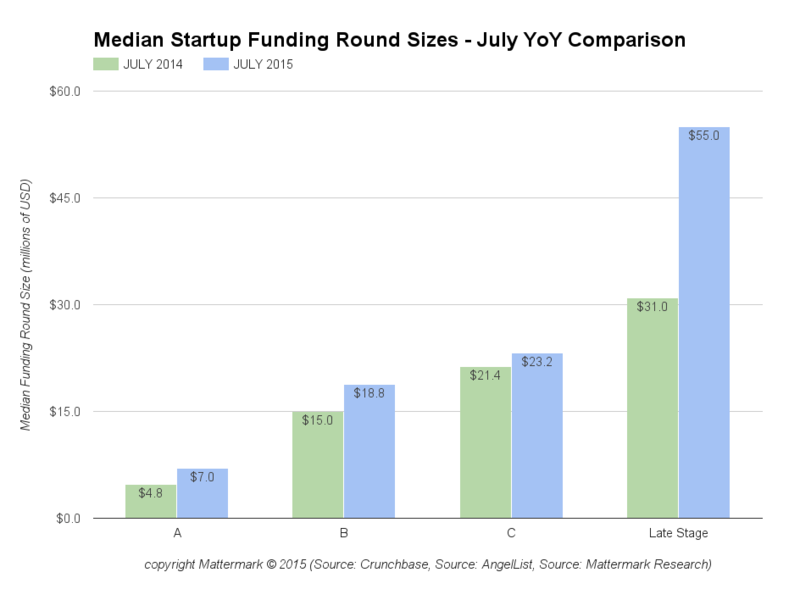 July saw a 39% overall increase in median round sizes compared to July of 2014. The largest increase occurred in late stage rounds, which were up 77% year-over-year. 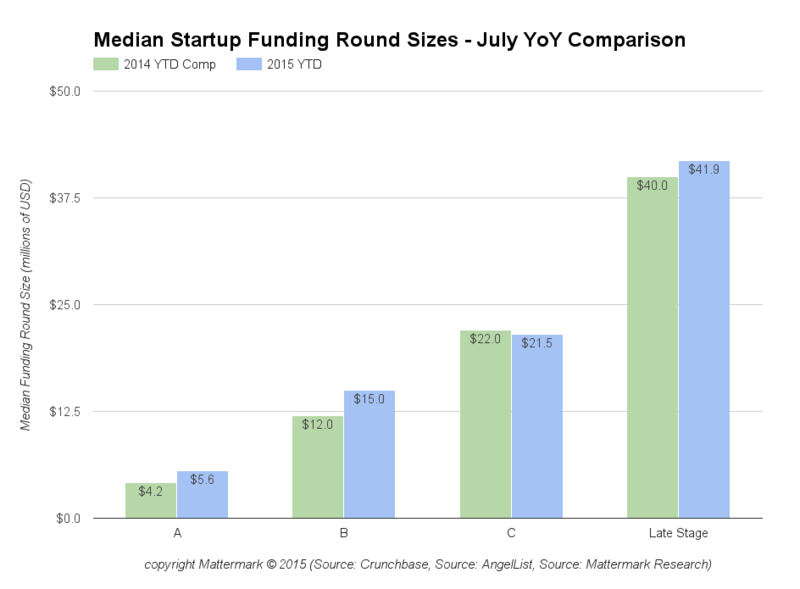 Series A, B, and C rounds saw increases of 46%, 25% and 9% respectively. Mega rounds in the late stage category in July 2015 included $2 billion to Didi Taxi (Coatue Management, Tencent Holdings, Alibaba, Hillhouse Capital Group), $300 million to DraftKings ($300M USD from Kraft Group, The Walt Disney Company, Fox Investments), and $275 million to FanDuel (Comcast Ventures, Time Warner Investments, KKR, Google Capital). July median round sizes significantly surpassed the 2015 year-to-date trend of an overall 15% increase to median round sizes. While Series C and late stage rounds appear to have stabilized a bit more year-over-year, Series A and B rounds both continue to climb (+33% and +25% respectively). There has been a great deal of discussion about a “private market bubble” and we believe round sizes are often a useful indicator of higher valuations, as investors hold strong to their ownership requirements and compete for deals by offering bigger checks for the same amount of dilution, with a higher hurdle the company must meet before taking their next financing. This is a developing trend, and we will continue to report as it progresses.